The marine terminals at the Port of Los Angeles and Port of Long Beach continued to experience unusually high congestion during November, and responded by operating 55% more OffPeak truck gates than originally scheduled. The largest cause of congestion over the past several months has been the shortage of available chassis. This has been compounded by shortages of available longshore labor and truck drivers. Marine terminal operators (MTOs) continued to work additional shifts in November to alleviate congestion. MTOs operated 118 additional gates (shifts open to truck traffic) in November, a 55% increase over the 213 OffPeak gates originally scheduled for the month. The MTOs operated 73 additional gates in September, a 30% increase, and 86 additional gates in October, a 33% increase. The MTOs have been spending $3 million per week on additional and unbudgeted costs since September 1 to manage congestion. In addition to adding unscheduled gates and shifts, terminals have been working overtime and through lunch and breaks, and paying truckers to move containers between terminals to load on-dock trains. The same factors increasing congestion inside the terminals have also driven up truck turn times. Below please find data from November. For comparison, the average in-terminal turn time in October 2014 was 51.8 minutes for the day shift and 55.5 minutes for the night shift. *The ports define frequent callers as trucks making one or more moves per weekday. Average moves per day by frequent callers tells us how many moves a truck can make if it is working every day. In November, 15 percent of frequent callers made four or more moves per day. Note: All terminals were closed for the Thanksgiving Day holiday, and for an ILWU meeting on Nov. 6. To learn what it takes for a truck to drop off or pick up a container at a marine terminal, please see http://youtu.be/P9IJN1yIIJ4. Marine Terminal Operators (MTOs) at the Ports of Los Angeles and Long Beach in November continued to work additional shifts to alleviate recent congestion. MTOs operated 118 additional gates (shifts open to truck traffic) in November, a 55% increase over the 213 OffPeak gates originally scheduled for the month. The terminals have been working with industry partners to relieve a surge in congestion caused by a disruption in chassis availability and other factors. The MTOs operated 73 additional gates in September, a 30% increase, and 86 additional gates in October, a 33% increase. These additional gates include both OffPeak shifts (Monday through Saturday nights and Saturday daytime) and Sunday shifts, which fall outside the OffPeak program. The regular schedule of gate operation is available at https://www.pierpass.org/wp-content/uploads/2014/10/PierPass-Offpeak-Schedule_10-25-14.pdf. Monthly scheduled totals vary according to the number of business days and holidays in each month. The number of regularly-scheduled OffPeak gates was 245 in September, 258 in October and 213 in November. LONG BEACH, Calif., November 17, 2014—PierPass Inc. executives have concluded meetings with the five Federal Maritime Commissioners (including Chairman Mario Cordero) and with FMC staff, briefing them on measures the marine terminal operator (MTO) members of PierPass are taking to address the current congestion issues in the Ports of Los Angeles and Long Beach. In a series of meetings late last week in Washington, D.C., PierPass also met with representatives from the National Retail Federation, the National Industrial Transportation League, the Waterfront Coalition, and the Agriculture Transportation Coalition to provide them with these updates. PierPass Chairman Bruce Wargo and President John Cushing reported that the MTOs have been spending $3 million per week on additional and unbudgeted costs since September 1 to manage congestion. These expenditures include adding unscheduled gates and shifts; working overtime and through lunch and breaks; and paying truckers to move containers between terminals to load on-dock trains. The MTOs operated 73 additional gates (shifts open to truck traffic) in September, a 30% increase compared to the number of scheduled OffPeak gates, and 86 additional gates in October, a 33% increase. PierPass also shared new initiatives its members are deploying to address chassis availability issues and to expand container delivery options to increase terminal productivity. These initiatives include the Free-Flow Program, which pre-positions large blocks of containers to enable quicker turn times for trucks picking up containers headed for a common destination. The meetings provided an opportunity for PierPass to discuss recent calls for it to waive its Traffic Mitigation Fee (TMF). The TMF offsets part of the cost of running the OffPeak Program, which has essentially doubled the capacity of the Ports of Los Angeles and Long Beach by running regular night and Saturday shifts. Charging the TMF on daytime cargo movement also provides the incentive to use the second shift. The OffPeak program has successfully balanced the flow of trucks to the ports, which prior to OffPeak’s introduction in 2005 was causing severe daytime congestion on Southern California roads. In the meetings, PierPass cited its concerns that by waiving the TMF, the previous congestion problems would be reintroduced and would exacerbate the current congestion caused by a range of factors including shortages of available chassis. PierPass President John Cushing on Friday published the following op-ed in the Journal of Commerce. The original article is available here. The Ports of Los Angeles and Long Beach are experiencing the most serious congestion in years. While a broad range of factors have contributed to the situation, there is widespread agreement in the industry that the largest single problem right now is a shortage of available chassis. That problem and related ones are the focus of intensive activity by the ports, the terminal operators and other stakeholders in the supply chain. Meanwhile, the largest single solution to congestion over the past decade has been the OffPeak Program run by PierPass, which essentially doubled the capacity of the two ports by running regular night and Saturday shifts since 2005. The central enabling factor of the OffPeak Program is the TMF (Traffic Mitigation Fee), which has a dual purpose. By charging the TMF on daytime cargo movement, it provides the incentive to use the second shift. And the TMF is used by the terminal operators to help cover the labor costs of operating these additional shifts. A handful of trade associations representing importers and exporters last week called for the TMF to be temporarily suspended or turned into an around-the-clock flat fee paid on all containers, claiming this would somehow relieve congestion. None of them have explained how this would relieve congestion. So what’s this really all about? The current pile-on is an attempt to use the congestion crisis to accomplish an unrelated goal, one that has nothing to do with relieving congestion and would in fact greatly increase it. Many of these groups have for years advocated for eliminating the Traffic Mitigation Fee for a variety of different reasons. They love the OffPeak gates, they just don’t want to pay for them. Truck drivers and trucking companies don’t pay the fee, and neither do federal, state or local taxpayers. The OffPeak Program was designed to be paid for by the importers and exporters who use the ports to ship and receive their cargo. These trade associations are calling on government agencies (the Federal Maritime Commission and the two ports) to force private companies to provide highly expensive services for free. Doing so would inflict severe financial harm on the terminals. Running the OffPeak gates is inherently expensive. Terminal operators cannot pay for the labor that is required to maintain OffPeak gates without a compensating source of revenue. The TMF has never fully paid for the OffPeak Program. When the terminals nearly doubled the number of gate hours per week with OffPeak in 2005, container volume was expected to grow rapidly to fill the new second shift. However, by 2013 volume was only slightly higher than it was in 2005 (14.6 million TEUs in 2013 vs. 14.2 million TEUs in 2005). In other words, in 2013 terminal operators ran nearly twice the number of shifts to move the same volume of cargo they did in 2005. As a result, the terminals have never recovered the full costs of the night gate operations. The shortfall between TMF revenue and OffPeak gate costs was $64.9 million in 2013. The terminal operators have paid the balance every year since 2005. The terminals are highly motivated to relieve the congestion that is choking their ability to operate and driving up their operational costs. Since September 1, the 13 terminals have been spending an additional and unbudgeted $3 million per week on extra labor to open additional gates and manage yard congestion. Fortunately, many in the supply chain are actively working together to tackle what are widely acknowledged to be the real causes of the current congestion problems. The recent agreement by the four largest chassis leasing companies to form a common pool is a big step forward. The challenges of multi-terminal calls by alliance partners are being addressed. Terminals have been running extra shifts and gates, and have been coordinating with cargo owners and trucking companies to deliver large blocks of containers in a free-flow process. Meanwhile, trucking companies and railroads are making operational changes to better deploy their drivers and rail assets. To achieve real solutions, we need to stay focused on the real problems. As you may know, congestion at the Ports of Los Angeles and Long Beach has increased over the past several months amid disruptions in the supply of chassis and other factors. The marine terminal operators, while not owning chassis themselves, have been working with other key parties including chassis leasing companies to help mitigate the problems. The chassis disruptions have been compounded by ocean carrier alliances that are dispersing cargo among more terminals, the arrival of larger ships, a shortage of rail cars and locomotives, and the struggles of trucking companies to retain drivers. In the meantime, the terminals continue providing additional labor to ensure sufficient capacity at the truck gates. The majority of the 13 international container terminals at the Los Angeles and Long Beach ports are keeping truck gates open during lunch hours and shift changes. 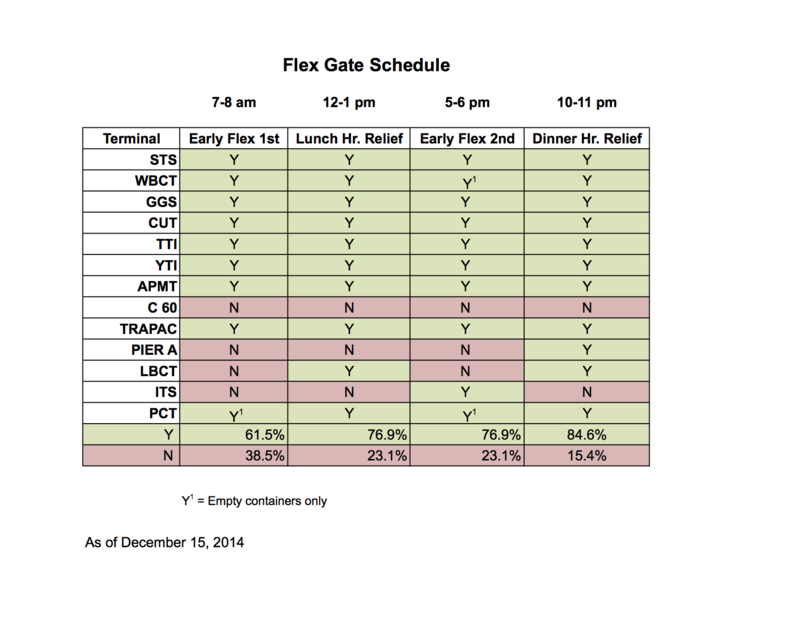 As the accompanying schedule of relief and flex gates shows, 77% of the terminals are hiring additional labor to keep terminal gates open during the day shift’s contractually-mandated lunch hour from noon to 1:00 p.m., while 85% are keeping gates open during the OffPeak shift’s 10 p.m. to 11:00 p.m. dinner hour. Terminals are also opening gates early in the morning (flex gates) and keeping them open between shifts. Ten of the 13 terminals (77%) are running truck gates between the end of the day shift at 5:00 p.m. and the start of the OffPeak shift at 6:00 p.m., while eight (61%) are opening an hour before the 8 a.m. start of the day shift. In addition, terminals continue to adjust OffPeak shift availability to meet demand. Beginning on Saturday Oct. 25, Global Gateway South (GGS) terminal at the Port of Los Angeles will begin offering an OffPeak shift during the daytime on Saturdays, bringing the total number of terminals operating Saturdays to eight. Monday, Wednesday and Thursday nights each have 12 terminals open to trucks, while all terminals are currently open Tuesday nights. While we anticipate congestion will ease somewhat as the peak season passes, we expect it will take several months for the chassis situation to significantly improve. Although the current delays aren’t due to availability of truck gates, the terminals are monitoring the situation closely and will continue to adjust gate hours as needed. Each month we provide a summary of the latest transaction data from marine terminal operators (MTOs) at the Port of Los Angeles and Port of Long Beach. Below please find data from the month of September 2014. For comparison, the average in-terminal turn time in August 2014 was 49.1 minutes for the day shift and 48.1 minutes for the night shift. September was a particularly difficult month. Truck turn times increased due to cargo volumes increasing, chassis shortages, and rail availability causing cargo delays and an increase in the average in-terminal truck turn times. In-terminal turn time is the average amount of time a truck is inside a terminal to complete a transaction. Truck activity information is derived from RFID data, and excludes lunch hour, breaks and trouble tickets. Turn time at individual terminals will vary depending on time of day and other factors. For more information about turn times and how we measure them, please see our Q&A at http://goo.gl/PiOjBp. *The ports define frequent callers as trucks making one or more moves per weekday. Average moves per day by frequent callers tells us how many moves a truck can make if it is working every day. In September, 25 percent of frequent callers made four or more moves per day. The number of unique trucks calling on the ports in September was 10,389. All terminals were closed for the Labor Day Holiday. Several terminals were closed due to the port fire September 22nd and 23rd. Each month we provide a summary of the latest transaction data from marine terminal operators (MTOs) at the Port of Los Angeles and Port of Long Beach. Below please find data from the month of August 2014. For comparison, the average in-terminal turn time in July 2014 was 48.7 minutes for the day shift and 49.2 minutes for the night shift. *The ports define frequent callers as trucks making one or more moves per weekday. Average moves per day by frequent callers tells us how many moves a truck can make if it is working every day. In August, 27 percent of frequent callers made four or more moves per day. The number of unique trucks calling on the ports in August was 10,313. All terminals were closed one night for the second shift for an ILWU Stop Work meeting on August 7. LONG BEACH, Calif., Sept. 11, 2014 – PierPass Inc. today launched the Free-Flow Program, testing a new cargo-handling process expected to significantly reduce the time it takes participating trucks to pick up containers at marine terminals. Today’s random-access process – where any truck can show up at any time to pick up any container – hasn’t changed since containerization began in the early 1960’s. With new, larger ships unloading as many as 5,000 containers at a time, the random-access process is creating efficiency challenges at major ports around the world. The free-flow process enables bulk delivery of large groups of containers belonging to the same cargo owner, trucking company or logistics company. Under the Free-Flow Program, PierPass is working with participating terminals, trucking companies and cargo owners to test free-flow, measure its impact on cargo velocity and costs, and learn what methods and resources are needed to run free-flow successfully. If the testing demonstrates significantly positive results, free-flow is expected to become a regular part of terminal operations. In a typical case, a large retailer that has 80 or more containers arriving on a single ship will arrange free-flow delivery with the marine terminal. In other cases, a trucking or logistics company can arrange for free-flow by consolidating groups of containers from multiple cargo owners. Under the current system, when terminals unload containers from arriving ships they pile them into stacks in the order they come off the ship. When trucks arrive and request a specific container, it has to be located and dug out of a stack that can be four or five containers high and six containers deep. Container-handling equipment like rubber-tired gantry cranes (RTGs) must move an average of three containers to dig a specific container out of the stack and deliver it to a waiting truck. As a result, one RTG can deliver an average of only eight to ten containers per hour. Using the free-flow process, a tophandler crane is expected to deliver as many as 20 containers per hour. The free-flow process starts when a ship is being unloaded. All containers claimed by a single owner, trucking company or logistics provider are piled into a separate stack. The cargo owner or its representative then sends a stream of trucks into the marine terminal through a special lane, and each truck takes the next container in the stack. Trial runs of free-flow have shown a range of results and are helping terminal operators and trucking companies learn how to best structure the process. At best, trucking companies have reported turn times as short as 11 minutes, compared to about 45 minutes for a typical transaction. Terminal operators believe that free-flow might eventually account for as much as 30% of cargo moves. While the trucks participating in free-flow will see the most dramatic improvement, the process should have a spillover benefit to the rest of the trucks, by reducing the number of trucks in the RTG lanes. For additional information about the Free-Flow Program, see Rule 14 in the West Coast MTO Agreement’s Marine Terminal Schedule No. 1, available at https://www.pierpass.org/wp-content/uploads/2014/09/wcmtoa-10-8-schedule.pdf. PierPass is a not-for-profit company created by marine terminal operators at the Port of Los Angeles and Port of Long Beach in 2005 to address multi-terminal issues such as congestion, air quality and security. To learn what it takes for a truck to drop off or pick up a container at a marine terminal, see http://youtu.be/P9IJN1yIIJ4. For additional information, please see www.pierpass.org. Over the past few months, some port interests have been promoting the idea of mandating that terminals in the Ports of Los Angeles and Long Beach operate truck gates 24 hours a day, seven days a week. On behalf of the terminal operators, I recently summarized our point of view on this position in a letter to a Member of the U.S. Congress. Because this issue has significant implications for port users, I am sharing our point of view with the broader cargo movement community. While the idea may seem appealing when considered in a vacuum, it can’t survive a basic cost/benefit analysis. Such a mandate would undermine the competitiveness of the San Pedro Bay ports, as it would raise costs for shippers and drive away cargo. When the terminals nearly doubled the number of gate hours per week under the PierPass OffPeak program in 2005, container volume was expected to grow rapidly to fill the new second shift. However, by 2013 volume was only slightly higher than it was in 2005 (14.6 million TEUs in 2013 vs. 14.2 million TEUs in 2005). As a result, marine terminal operators have never recovered the full costs of the night gate operations. The incremental costs of the current OffPeak night gates are approaching $180 million annually, with TMF collections falling short by $64.9 million in 2013. The West Coast Marine Terminal Operators Agreement members recently contracted an accounting firm to calculate the cost of operating seven days a week, at either two shifts or three shifts per day. The firm took into account an expected decrease in the cost of existing shifts as a portion of cargo volume flows into the new shifts. Mandated 24/7 operations at the terminals would be financially crippling and would offer little practical benefit to the trucking industry. The second half of the existing night shift, from 11:00 p.m. to 3:00 a.m., is significantly underused by trucking companies. The hour beginning at midnight receives only 66% of the traffic received during the busy hour beginning at 6:00 p.m., while the hour starting 1:00 a.m. receives only half (53%) of the 6:00 p.m. traffic. Traffic during the start of the day shift is similarly light. When the terminal operators added the OffPeak second shifts in 2005, they and other stakeholders expected harbor trucking companies to begin running two shifts per day. While many have done so, a large proportion of trucking companies and drivers are instead operating a single shift, spanning the afternoon of the peak daytime shift and the first half of the night shift. If they’re not even taking advantage of having two shifts, there is little or no reason to believe that they would make much use of a third shift. Unlike in 2005, there is no capacity crisis that needs to be addressed through a hugely expensive increase in hours of operation. Nor will 24/7 operations will do anything to fix the largest cause of daily truck gate congestion: trucking companies sending trucks to park outside the terminals waiting for the OffPeak shift to start. These trucking company practices directly influence the length of turn times. Truckers can reduce their turn times by moving containers during the 8 to 10 hours per day when lines are short, and by taking simple steps to avoid trouble tickets. President and CEO, PierPass Inc.